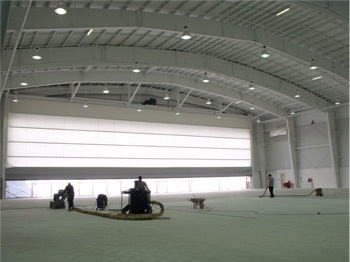 FCC Construction provided construction management services for Irving Oil's new hangar at the Saint John Airport. The facility provides a new home for Irving Oil’s Aviation Services aircraft and personnel. The project was a real OSCO “team effort”. 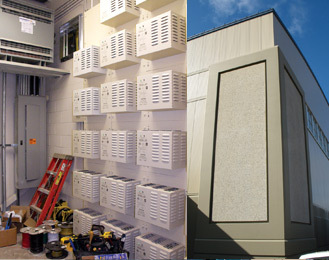 In addition to FCC’s general contracting services, five other companies/divisions supplied products and services: ready-mix concrete by OSCO Concrete; reinforcing steel by OSCO Rebar; structural steel by Ocean Steel; precast concrete by Strescon; and electrical work by FCC’s Electrical. Built to house the current fleet of planes with room for expansion, the state-of-the-art hangar includes: high tech workstations; a curved hangar roof; epoxy floor; in-floor radiant heating; and a special, 110 foot long fabric hangar door. The all-white interior is light and bright. The building also includes an office/support wing, which will be home to the pilots and support staff required to keep the planes flying. The single-story wing includes a parking garage, maintenance shop, parts storage, technical library, kitchen, offices, meeting room, flight planning center and passenger lounge.